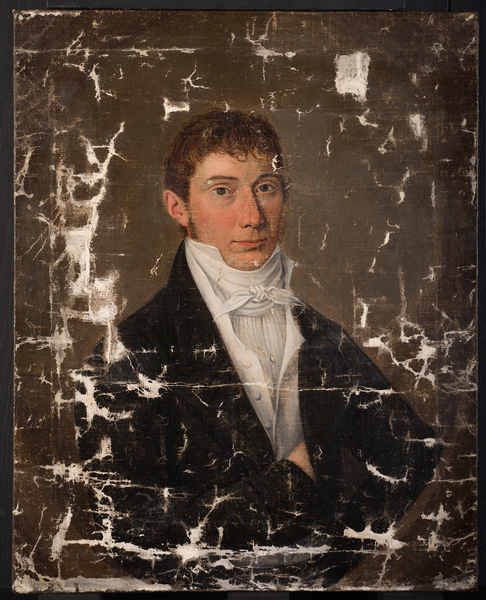 When this early nineteenth-century portrait came to Winterthur, it was damaged and overpainted. Nevertheless, its potential historical significance excited the museum staff. 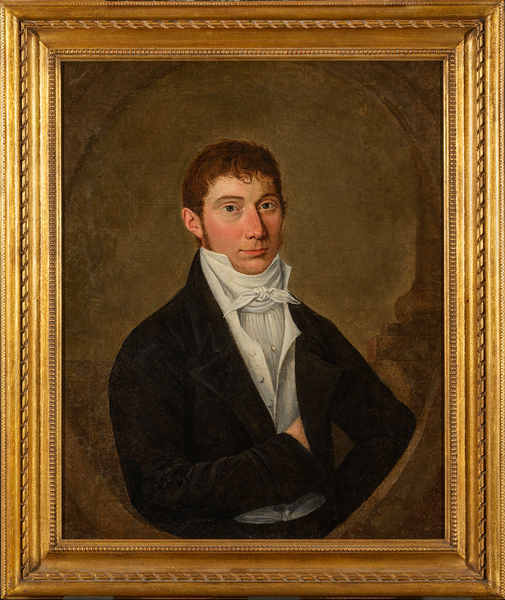 According to family tradition, the man in the portrait is John Moale Russell (1784−1827), a member of Baltimore’s prestigious Moale family. 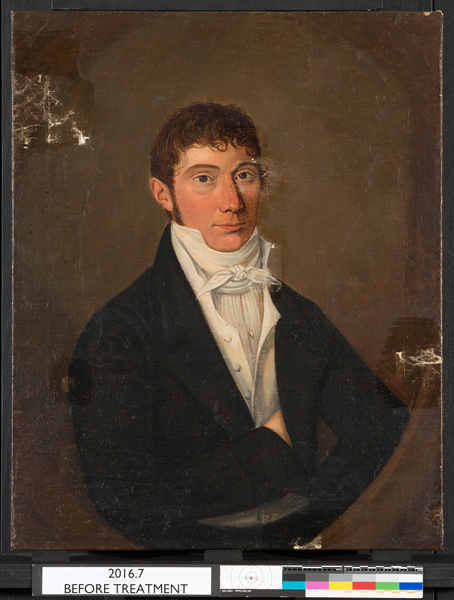 Although the sitter’s identity is unconfirmed, if this gentleman is a Moale, it is possible that the artist who painted the Moale family matriarch (Ellin North Moale) could have painted this portrait. That artisan was Baltimore’s Joshua Johnson. Johnson is the first documented African American painter in America. He was born the son of a white man and a black slave in Baltimore. Manumission records show that his father likely paid for Johnson to be freed by his nineteenth birthday. 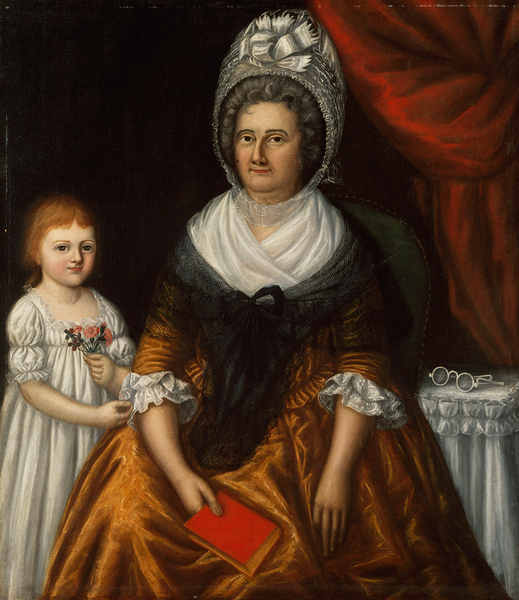 In 1796, Johnson began advertising in Baltimore city directories and newspapers as a portrait painter of “self-taught genius.” He continued to paint into the 1820s. To date, more than eighty portraits, mostly of affluent Baltimore residents, have been attributed to him. Could this be another? The Winterthur conservation and curatorial departments have been working to solve this mystery. Paintings conservator Matthew Cushman cleaned the painting and uncovered and consolidated the original surface. From there, its composition and painterly style were compared to known examples of Johnson’s work. Genealogical research confirmed that the gentleman is likely a grandson of Ellin North Moale, a son of her daughter Rebecca (Moale) Russell (1763–1840). Thus far, the evidence is inconclusive. 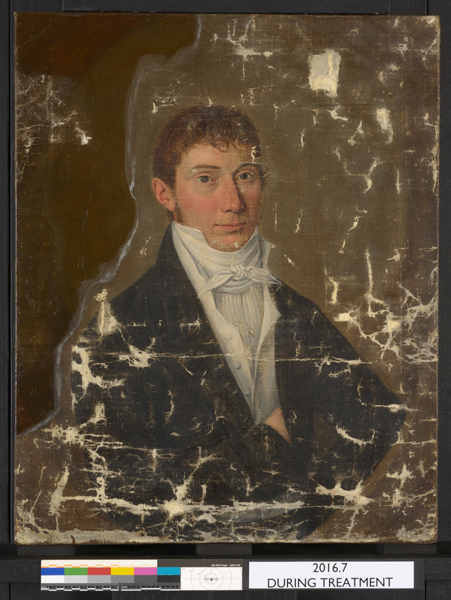 Whether by authenticating this portrait or acquiring another in the future, Winterthur hopes to add an example of Joshua Johnson’s work to our collection. 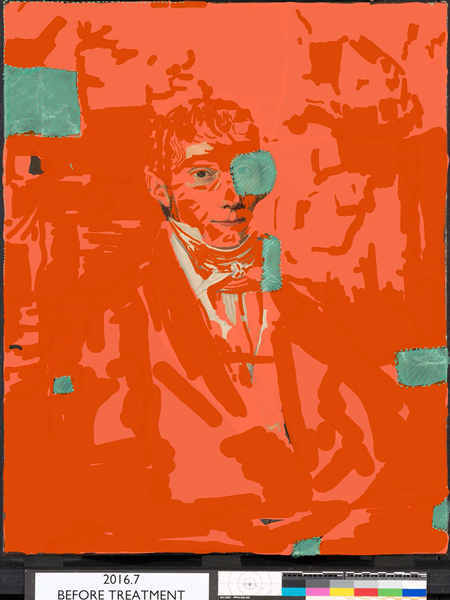 This diagram maps the distribution of overpaint (paint touch-ups added later) on the surface of the portrait when it arrived at Winterthur. As the red and pink areas show, approximately 90 percent of the surface consisted of overpaint (the blue spots were cleaning tests). Photo, Matthew Cushman.